Update: The ban in Ireland has now been lifted. Details here. In recent years, a number of the old giants of Japanese Video Game publishing have been increasingly turning their attention to the PC gaming. It seems to me that this is part of a general trend of seeking to become less insular, diversifying their output to be less dependent on the handful of console platforms available to them, and a recognition that there is a strong business case for catering to PC gamers. Whether it’s Sega’s transition to a PC publishing powerhouse, Namco Bandai’s eventual capitulation to the hoards of petitioners and bringing Dark Souls to PC (making a boatload of money in the process), or Capcom’s shift towards cross platform development with their in house tech and their outsourced projects, it’s clear that there’s gold in them thar hills. Whilst PC gaming isn’t a massive market inside Japan, there is a huge international market for Japanese developed games for PC platforms. Especially since digital distribution is far more prevalent on PC than on traditional console platforms, it’s feasible to port a previously console only game over to PC, and more than cover the porting costs with a low risk digital only release. We’ve seen Konami dip their toe into this space with Castlevania: Lords of Shadow, but now it’s time for the utterly fantastic Metal Gear Rising: Revengeance to get a PC release, it’s due out on Steam on the 9th of January. 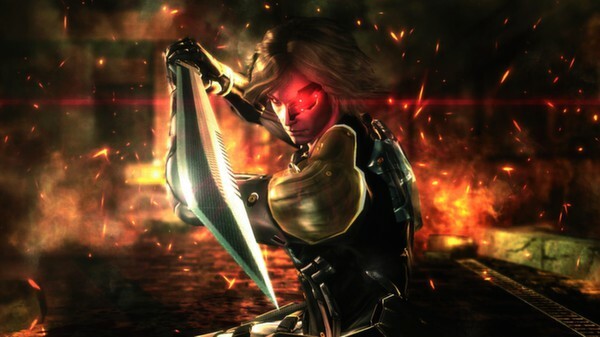 Revengeance certainly had a somewhat troubled development (read about it here), but before Platinum Games took over and saved it, it had always been slated for a PC release. This initially appeared to go out of the window once Platinum took over, they have never shipped a PC game before, and ever since they were unhappy with the results of Sega’s outsourced PS3 port of Bayonetta, they have developed all ports internally. So with no experience in the field, and no intention whatsoever to let anyone else handle the port, a PC release seemed off the cards. But thankfully for those who wish to see Platinum Games’ titles released for PC, it appears that they’ve either staffed up, or their current staff have been learning the ropes of developing and shipping games for PC, and soon enough PC gamers will be able to play this fantastic piece of digital entertainment software about cutting dudes up into tiny little pieces and absorbing their spines. Not all PC gamers though. Konami have made some decisions about how they’ve handled the PC release that are consumer hostile, and it’s not entirely clear why. Lets unpack them a bit. Revengeance is being released as a Steamworks game, so this means although it is available to purchase from a range of distributors, if you buy it from anywhere other than Steam, you will just receive a serial code to enter into Steam. My data suggests that this is generally extremely popular with customers, and when given the choice between a Steam key for a game, or a direct download, SavyGamer users typically opt for a Steam key at a ratio of around 10:1. However, Valve have built region locking functionality into Steamworks, and it seems Konami have opted to use this functionality with the release of Revengeance. 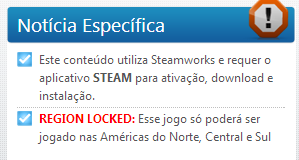 This means that serials bought from distributors in one region will not work for customers located in another, unless the customer opts to use a technical measure to bypass the region locking (breaching Steam’s user agreement in the process). Distributors like Amazon US, Gamefly, Greenman Gaming and Nuuvem are all selling region locked serials. Amazon US and Nuuvem will sell serials to any customers, but these serials won’t activate on Steam for customers outside of North/South America (and Nuuvem are kind enough to make this clear before customers purchase from them). Gamefly and Greenman Gaming simply don’t have listings for the game available for customers Europe. On top of this, Revengeance is simply impossible to buy on Steam in some regions. It is absolutely impossible for customers in Ireland or India (Update: and Japan, home of both the developer and the publisher) to buy Revengeance directly from Steam, they’re simply told “This item is currently unavailable in your region”. Konami have also opted to disable cross-region gifting through Steam. There’s been several instances in the past where games have been unavailable on Steam in certain regions for censoring/ratings reasons, but a workaround has been for customers outside of those regions to gift the games to those for whom it is not available. Because of Konami’s decision to disable cross-region gifting, that will not be possible here. All this results in a situation where Revengeance is going to be exclusively available through torrent sites for some users, but even users who aren’t entirely prevented from purchasing the game are impacted by these decision. Konami are using the region locking functionality provided by Steamworks to engage in a process called regional pricing discrimination. This is a process by which different regions are split up into different markets, and pricing is determined on a case by case basis for each region, in an attempt to maximise revenue. This list price for Revengeance on Steam in the UK is £19.99, and there’s a 20% preorder discount, bringing it to £15.99. The USA Steam list price is $29.99, with the same 20% discount bringing it to $23.99. This represents a slightly cheaper price in the USA than the UK, although this is fairly typical for most games available on Steam. However, the Russian Federation list price is 499 Rubles, or 399 Rubles with the 20% discount. 399 Rubles is equivalent to ~£7.32, less than half the UK price. Similarly, Brazilian distributor Nuuvem have a list price of 49.99 Brazilian Real, equivalent to £12.81, and they had a (now expired) pre-release 35% discount, bringing it to ~£8.56. The benefit to Konami of engaging in regional pricing discrimination is that they are able to charge customers in more affluent regions higher prices, but still make money from customers in less affluent regions. The wikipedia topic on this is as good a starting place as any if you want to read up more about this economic function. This isn’t illegal, and there’s a debate to be had over whether it is immoral, but I’m firmly of the opinion that charging people more simply because of the country they are in is poor customer service, constitutes a disrespectful relationship between the publisher and the customer, and it deserves to be highlighted. There have also been instances where a game has been made unavailable to purchase from Steam in certain regions because the publisher has negotiated an exclusive deal with a local distributor in that region. I’ve not seen any evidence to suggest that Konami have engaged in this with the regions that Revengeance is not available in on Steam, but it’s something to look out for. Attention people asking. I don’t know why @konami isn’t selling MGR PC in your country. We are the developer, not the publisher. In my role as Avant-Garde Economist running SavyGamer, it’s my job to find the best deals on games for my users. This region locking makes providing that service more difficult. It means that customers are restricted in their ability to force digital distributors to compete to offer the best value and service in exchange for their money. I think it is a bad thing, and I’ve tweeted at @Konami to tell them exactly that, I suggest you do the same if you feel similarly. Despite all this, I am hugely looking forward to playing Revengeance again on PC. It was one of my favourite games of 2013, and Platinum are a peerless studio. They only make the best action games in the world. My blade yearns to bathe in the blood of my enemies. Boycott it, at least that’s what I’ll be doing. Wow, this is a superb comment. Thanks! Poland and Germany are both in same Steam price region. I think this system is broken. I would rather pay one, global, even a bit higher price, than look around for options how to get games cheaper from other countries. You say “there’s a debate to be had over whether [price discrimination] is immoral.” But actually, that debate finished years ago – it’s staying. There are dozens of situations where it’s accepted, and some where it’s even praised as a generous approach. – In the UK, 2 million of the poorest households receive discounts or rebates on their fuel bills so they can afford to heat their houses. Everyone else has to pay more, but it’s generally seen as fair. – Restaurants and pubs tend to be more expensive in affluent cities than in rural areas. Overall, more people can afford to visit them, and the owners make more money. – Some health companies provide key drugs and vaccines to poorer countries in Africa, or those affected by natural disasters, at a steep discount. They don’t make much money from this, but they save a lot of lives. If they were forced to charge the same prices everywhere then they wouldn’t be able to do this… they’d go bankrupt. – Entertainment companies launch films and music in different countries at different times, to coincide with marketing campaigns. One Direction did this, launching in the US much later than the UK, but the extra attention paid to the US market has made them worldwide superstars. In short, it’s a fundamental part of the world economy that companies can choose when to sell their goods, when to launch them, and how much to charge. It’s accepted, it’s staying, and the debate was closed years ago. Now IF Konami’s game is priced unrealistically, they’ll lose sales. That’s the risk they take. I made a quick check and it’s actually available on Steam in the UK for just £16 – a pretty good price for a pre-release game for a major developer. This website has recommended many similar games at that price in the past. That shouldn’t change because the game happens to be cheaper in Brazil. And honestly – if a game was cheaper in the UK than elsewhere, would you boycott that? I would just like to also point out that what you pay for a game is what you think it’s worth. Doesn’t matter how much it costs elsewhere, if you feel the amount you’ve paid is justified, there’s no reason to bemoan having paid more than someone else. tbh i live in france and 95% of my games are ordered from amazon uk simply because they are at least 50% cheaper as opposed to amazon Fr. on release day i can find a game on amazon uk for around 37-44 € while here i’ld have to pay the equivalent of 55-70 €, this is just insane. but im glad i have the option to get my games cheaper elsewhere..
To be honest I’m not sure you’re examples are quite adequate comparisons. Following human rights and being humanitarian isn’t really the same thing as maximising profits. I don’t think Konami have the price lower in other countries because it’s the humanitarian thing to do. As for restaurants, they are similar to the games companies with regional price discrimination. I also think that the price of food and drink in cities is too high as it’s focused on making the most money. Rural areas are cheaper because they don’t have much chance of getting customers if they charge a lot. And your last example is about marketing which isn’t really relevant to price discrimination. Konami / Urban restaurants / other games companies are setting the prices to make sure they get as much money as possible. They try to see what price they can get away with and if they do then they increase the prices until people stop buying it. I don’t think it’s fair but that’s just capitalism and business in the modern era. At least bars have a semi-excuse of limited times to do business. Pubs have been closing at an enormous rate because in the boom years we had more disposable income so the prices rose and rose to exploit us, and then when money becomes tight the value of their product drops but they don’t drop the prices. Business slows and they shut down. It doesn’t cost games companies any more to get the product to different regions so the sole reason for price difference is to charge as much as they can get away with for that region. And the only way a region can try and balance it is to just not buy the product at that price. Like someone said in a reply before mine, if you think a product is worth the price you paid then that’s fine and it shouldn’t matter about prices elsewhere, but even then we use other games as benchmarks for how much we think a game should cost and if they’re all high then that high price becomes the norm and acceptable. This repeats reaching higher prices until we reach a level where the number of people who can afford the game drops enough that the higher prices is no longer worth it. £20 (non-pre order) is an okay price for a brand new game from a large company like Konami, but don’t forget that this game is nearly a year old now and I’m sure that number of people who have played it before has influenced the decision to keep the price lower. Sure it is easier to be annoyed with this sort of thing when you’re one of the ones suffering the most from it, but that doesn’t make it more/less fair if the regions were swapped. At some point it becomes and argument between capitalism and socialism so maybe that influences peoples point of view. I’m sure it’s easy to be capitalist if you’re comfortably solvent financially. Whats the point of the EU free market if I, in Ireland, can’t buy from the UK. I know its only a small thing like a game but still. I remember Deep Silver got into trouble having a UK region locked on Riptide that they changed. Also if I took the train to Belfast, would I be able to buy it then and then come home and play it? Not selling in Ireland is just a strange one, as we are the same market as France and Spain and such. 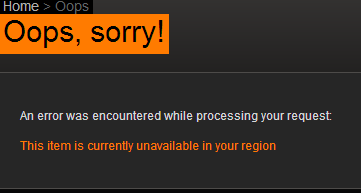 I’m from the North…usually in certain situations Steam Support would need to you’ve ‘moved’ before they can establish that you’re in a certain area for residence, then you can buy certain games and restrictions from the south would be gone for example…if you said you moved to the North. this attitude bugs me a lot, but it isn’t the first time I’ve witnessed games publishers pull this – I’ve spent several years in Japan and games are forever region-locked, over-priced or just plain not released on Steam there – as a gaming group over there we’ve forever been hit by it. As a global ‘connected’ world that we now live in, it is not unreasonable to expect parity in digital goods. Local taxes should of course play a part in how much you pay, but if I am in country xy, buy a physical product (a game dvd), I go home to country ab, install game from the dvd but yet Steam (etc) won’t let me play it… well, that’s just idiotic! Just because technology gives you the ability to do something, doesn’t mean you should?! I can only believe the Ireland block is the result of what happens when you let an intern take care of your Steam submission. I can’t think of any reasonable reason to block sales in Ireland, and yet sell it in every other European country. It’s virtually begging people to use a VPN to side-step restrictions. It will either be a mis-tallied sale, or a lost sale. You just can’t store up sales for later nowadays in a global digital economy. Most of the time you can get away with a bit of regional price-fixing so long as there’s a small hurdle like a different currency, a non-default store, or even the threat of getting your account locked – but to refuse to sell it at all is incredibly short-sighted. I personally don’t buy any games until they hit a price point I’m fine with and really couldn’t care less how they are priced outside of the US. As far as I knew games did cost more in Europe than the US because consoles cost more in Europe. Japanese publishers usually don’t sell their PC games in Japan. Neither Sega nor Capcom sell either their developed or published games with Very few exceptions. Add to that he price gauging in general for titles released in Japan (e.g. Call of Duty costs 100$) and the region locking starts to get scary. E. g. I could only buy Castle of Illusion via PSN (thanks God the region is locked to the credit card thete). In response to the comment about the size of the PC gaming market in Japan. It’s small, yes, but growing. It would be a lot larger if it was actually supported by the Japanese publishers and shops. But that is not the case. Most publishers as noted above (namely, Sega, Konami, Namco, etc.) will not release any games on the PC in Japan. Actually, SEGA released perhaps 2 games on the PC in Japan via DL Site. One being a Puyo Puyo game. But any major release is sorely absent. Capcom, on the other hand do release some of their games on PC and have done for several years. It’s just nigh on impossible to find them as most shops will not stock PC games. It may come as a surprise to learn that Japan is a supported GFWL region and even sold GFWL points specifically branded as the PC versions not the Xbox Live points, but I digress. Capcom, as I’ve said, have released several games on Steam in Japan, most recently Lost Planet 3 which, along with the recent Biohazard releases, had it’s “Windows” (ie, PC) release advertised on promotional materials displayed in various locations, such as in shops. This is highly rare. Most PC releases that do happen locally in Japan are not advertised by publishers. On the flip side though, Capcom are actively refusing to release several Japanese indie games in Japan despite holding the distribution rights to them for services such as Steam. So yes, there is PC gaming in Japan. And it is slowly growing. But that growth is intentionally being stunted by the very publishers who should be supporting it. You have to ask yourself, why are they closing off a potential avenue stream like this? This question becomes even more of a conundrum when you realize they are happy to release many of these games internationally with Japanese language support. But not in the country that would benefit from that most. Your point about pricing is disingenuous. You know there is more to it than just price discrimination. The problem with digital distribution is that some publishers are still treating these goods as if they were physical goods. The Balassa-Sameulson effect will lead to a divergence in prices for identical goods and services. What is going on here isn’t completely price discrimination, you are comparing the price of the game in the UK to Russia which isn’t an apples to apples comparison. Purchasing Power Parity (PPP) will lead to currencies having different values, as a consequence the US and UK will be charged at a higher rate but once you adjust this for PPP prices will be much closer (and no i don’t have the stats and its 4am while i am writing this so look it up yourselves). That said there may be a small element of third degree price discrimination, of course Konami aren’t going to release a brand new game in the UK for £7. To say its immoral is silly, its just economics. If you complain about this one game, then you should complain about them all as this isn’t a new trend just look at the prices on the Russian steam page store right now, (Assassins Creed IV is £15, Starbound is £5, XCom enemy within is £10 etc). I will add to my other message if you want to get really mad at this phenomena you should get mad at all the positive effects price discrimination can have, like you know allowing for developing countries to get access to ARV’s or other life saving drugs. Just because you can’t get your game for cheap doesn’t mean that this phenomena is “immoral” you have added your own value judgement against it because the cost is higher for you. I’ll just chip in with my 2c. I prefer getting my games more cheaply if I can, but I’m not particularly picky – as others have said, I have a good idea of what a game will be worth to me personally, and I’ll only buy it if the pricing matches. It’s definitely not the pricing that bothers me. But I do frequently buy, for example, Steam products via Amazon. A while ago a game I wanted was discounted on Amazon, but not on Steam. I had been waiting on it to be discounted so that it’d match what it would be worth to me. If it had been Steam, I’d have bought it there directly. The fact that it’s a different region never really occurred to me. What bugs me about this whole scenario is that this makes it very difficult to purchase games elsewhere that redeem on Steam because you can’t be certain that it will redeem properly until after you’ve paid for it. The thing is, there does appear to be a better solution. Humble Bundle has recently been using the Steam API to redeem keys to your linked Steam automatically, a system that (while it has its own flaws) works very well. Perhaps something similar can be implemented by Steam and used by other webshops to automatically determine whether a product would successfully redeem to your account? Hmm. Very interesting. Most digital distributors don’t actually list region locking, however Nuuvem do, so I have just been extrapolating from their information, and the fact that Gamefly et al weren’t listing it as available to buy outside of the US. Curious indeed. it’s seriously problem in ASIA countries, because there’s no retailer in this countries. i understand some of they’re games like FM, PES. but most of PC games is can’t purchase, regist, even excute own games. if you’re In ASIA or ASIAN, you can’t play the game even give a price to dollar and already purchase. they hate asian’s money, and hate asian. like last century’s fascist specters..
FYI, Castlevania Lords of Shadow 2 is also region restricted in Asia. This seems to be a trend with Japanese publishers (Konami and Sega specifically).